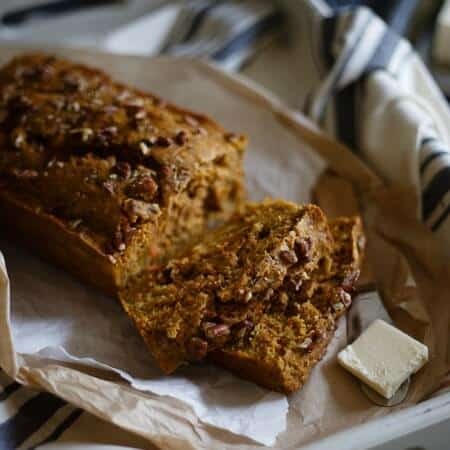 This mango carrot spice bread is made with whole wheat flour, packed with fresh mango, grated carrots and real carrot mango juice. Today is a historic day in our house. It’s a day I’ve been waiting for since approximately the second day of living here and realizing the major flaw in the only door that leads to our deck: it opens the wrong way. Not only does it open the wrong way, but the wrong panel (it’s a French door) opens too. So instead of opening out to the deck, it opens into a room that’s incredibly narrow to begin with. The fact that the wrong panel opens makes it so you literally have to shove yourself into the corner between the end of the couch and the door to be able to get out. Even Ginger looks at us like “wtf guys?” when she tries to slither through the opening. If you think I’m exaggerating the inconvenience of this door situation, I’ll have you imagine trying to bring plates, pans and whatever else out the door to the grill in the summer or, as was the case the other day, trying to maneuver a non-collapsed tripod outside for some photos. The latter of the two resulted in a full on melt down of cursing out loud to myself like a lunatic when the legs of the tripod ended up scuffing the wall as I muscled the stupid thing through the 12 inches of space. So today, I happily shell out $2,300+ to Home Depot and the nice installation man (because Ulysses absolutely refuses any part in this door replacement situation and in typical man fashion thinks the current door is “just fine”) as he spends 8 hours opening up our house and putting in a gorgeous sliding door. 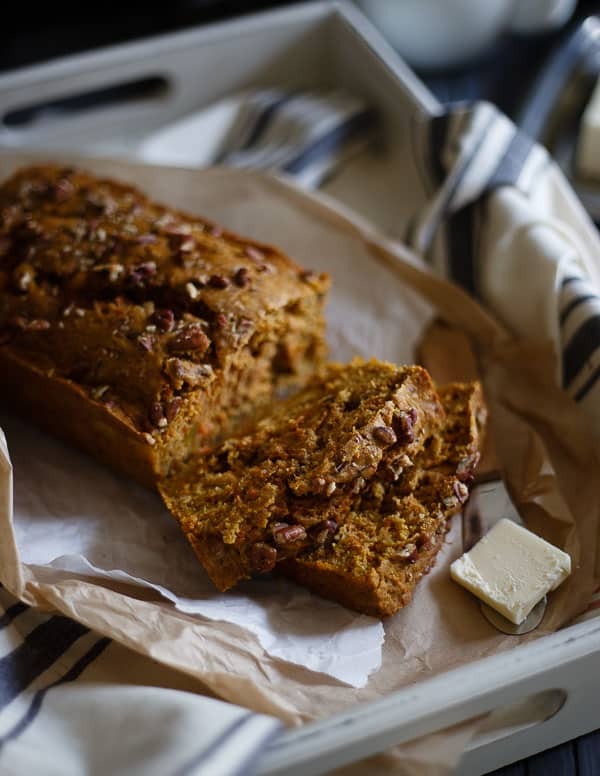 I hope he likes mangos and carrots because I plan on feeding him this mango carrot spice bread as a token of my gratitude for saving me from any future door meltdowns. Preheat oven to 350 degrees and grease a loaf pan with baking spray. Combine the flour, baking powder, baking soda, salt and spices in a large bowl. Whisk together the sugar, eggs, coconut oil, V8 vegetable & fruit blend and vanilla in a medium bowl. Fold in the carrots, mango and pecans until well combined. Transfer batter to the loaf pan and bake for about 40 minutes until toothpick inserted in the middle comes out clean. Remove from oven and let rest until cool enough to touch. Gently remove bread from the pan and let cool on a rack. 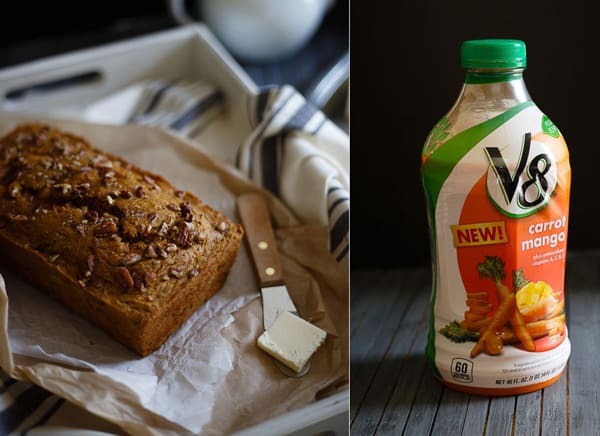 This bread is made with whole wheat white flour, fresh mangos, carrots and kept nice and moist with the addition of V8 carrot mango vegetable & fruit blend, one of V8‘s new line of shelf stable beverages that combines vegetables with a touch of fruit for an antioxidant packed drink. 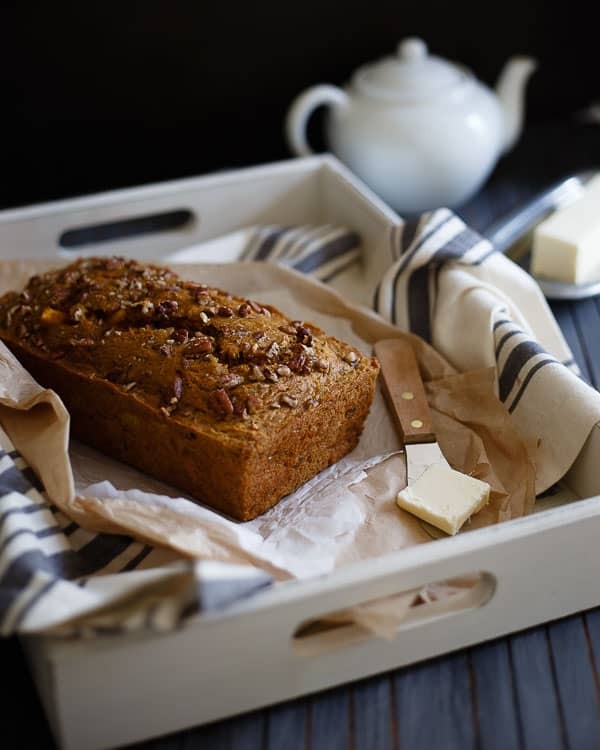 While I’ve loved every variety straight up, the natural sweetness of the carrot mango flavor seemed perfect for baking. This bread turned out like a healthy carrot cake with mangos but minus that addictive cream cheese icing. It’s just barely sweet so it makes a great addition to breakfast but just as good as a snack or healthier dessert too. *This post is sponsored by V8. All content and opinions are my own. Sometimes, if you want something done, you have to do it yourself. I think the Ho Po guys will love this bread. Pinned. I swear its the smallest things that bring the most joy! We are refinishing our cabinets and having a dining room as our pantry and then having to venture to the garage to cook our breakfast because that is where the microwave and stove are, is beyond annoying. So lucky you you get to kiss those days goodbye! And this bread? The tropical sense is calling my name! Congrats on the new door! I know it would have bugged me to death, too! And what can I say about this fabulous bread??? Mainly that I wish that it was in MY house instead of yours!!! I envy the HD guy! I’d love to munch on this gorgeous loaf! I get upset and uncomfortable when something is wrong in my house, and quickly run to fix it anyway I can, so I understand how you feel. looks delicious! Never tried mango in bread before, but I will have to try it out! and I have whole wheat white flour I have been meaning to use up! A door opening the wrong way is like putting the toilet paper in the wrong direction!! 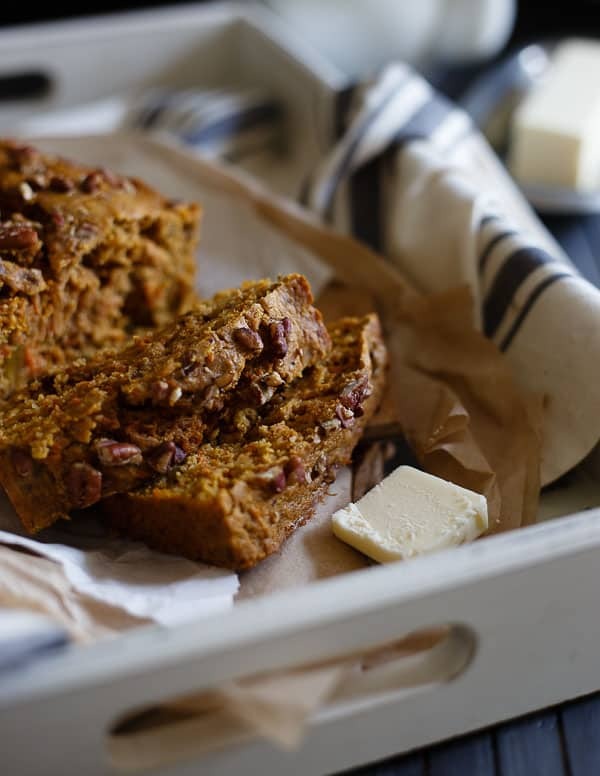 This bread looks comforting and flavorful! Oh noooooo, that’s the worst when you realized you’ve installed something wrong after all the work is done. I’m sure the Home Depot guy would love this gorgeous bread! If not, I’m ready to eat his share! Congrats on the new door! It really is the little things that make us happy, isn’t it? I love that you added mayo to this bread, it looks delicious! Gina! This looks beyond amazing and a great way to use up mango. They’re so cheap right now! I used to be in love with a V8 Strawberry juice so I’m sure this one is delish too.